The physical presence of this charming little town is aptly described in the local language form where the city derives its name from. It means on the hill top, and that's what the city is! Gangtok is perched high on a mountain which was supposedly flattened to build a monastery and eventually the city around it. The charming city carries an aura of mysticism with prayer flags fluttering with the wind and the sound of Buddhist prayers and bells echoing within the mountains. Adding to the charm are the flowers those bloom on the roadside and the locals of this place, naive and smiling, both give a sense of a grand welcome to this small city. The Capital of Sikkim emerges through the clouds in the shadow of the mighty Kanchandzonga and offers a lot to see and enjoy for a travel enthusiast. It was ruled by the Chongyals till the 1975, until it merged with the Indian sub-continent as the 22nd state of India. The footmarks of the regality are still evident in the capital where they reside and normal public does not have access to it.Lamas with their play wheels, colorful festivals, Tsechu dance, the Monasteries, the flowers and the natural beauty; all draw visitors to this place. But the view of the majestic Kanchandzonga takes the cake and memories of which calls you back and again to visit the small town. Location: The quaint little capital city of this tiny state is the only town which has a touch of modernization. Situated at the altitude of 5840 feet above the sea level this place is wet and cool round the year. Guarded by the majestic Kanchandzonga range and flooded with species of Orchids as it natural vegetation, Gangtok is one of the most beautiful places in India. 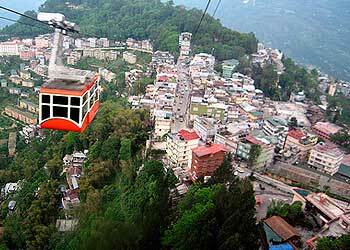 Climate: Nestled amongst the beautiful Himalayan Mountains, no doubt Gangtok experiences cold weather round the year. The summers are pleasant with abundant sunshine and pretty flowers blooming all around with massive waterfalls leaping down every nook and corner. Although winters are very harsh in this city, the monsoons are continuous, even during the peak winter seasons. So the best climate to enjoy the beauty is either March to May or October and November. 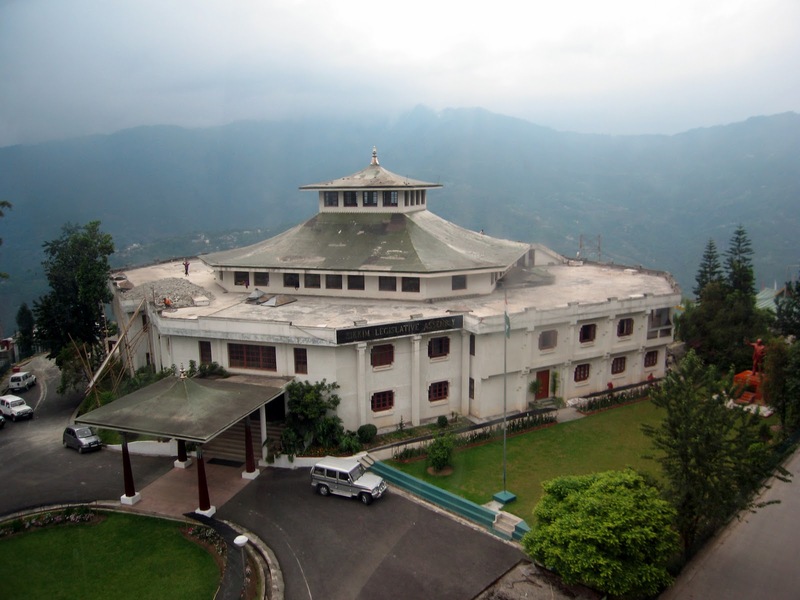 The most prestigious of its kinds in India, the Namgyal Institute of Tibetology is about 1.5 km from the main town of Gangtok. Housed in a beautiful building, built in the traditional Tibetan style, with murals, decorated columns and a wonderful smell of beeswax polish from the creaky wooden floor, the Institute was built in 1958 with the main motto to promote Tibetan studies and Buddhist philosophy. It houses a rare collection of prized objects of Buddhist importance. It has a rare collection of 30,000 books, Tantric documents, rare manuscripts written in gold on the bark of a poisonous tree, antique Thankas and 200 icons, all prized objects of art for the Buddhist world. Moreover, it also houses relics of monks, samples of Lepcha scripts, masks and sacred objects like Kapali, a bowl made from a human skull, and the carku, a flute made from a thigh bone. The Institute has won both national and international acclaim and the scholars from all over the world come here to study. Amidst such lush green hilly terrains, a breathtaking topography and misty mountains, is situated The Royal Plaza at Gangtok, the Capital of Sikkim. This luxury hotel is ideally located above a river valley with a view of paddy fields, forested slopes and snow capped mountain peaks. It is one of its kind in all of Sikkim and the North East India. The Royal Plaza aptly complements this exotic locale. Hotel is centrally located in the heart Gangtok with a magnificent view of the Sikkim Himalayas and hotel offers best servicess Foreign Currency Exchange, Travel Counter, Safe Deposit,Doctor on Call,Room Services,Laundry & Dry Clean Services,Postal Service. Sonam Palgey has its origin rooted in the Royal Heritage of Sikkim. Elephant Mansion was built for royal guests during the coronation of Sikkim's last King Palden Thondup Namgyal in 1963. The name "Elephant Mansion" is derived from it's being the largest structure of its time, with a snout like facade.